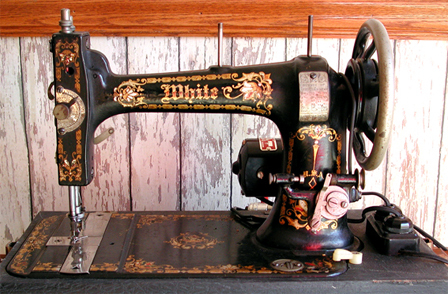 Jim considers this White sewing machine one of the best looking sewing machines in his collection. We have never seen another one like it. We bought it at an antique/collectible store in Perry, New York in a nice cabinet for $10. We removed the machine from its cabinet for the picture. We have no clue as to the age. Serial Number is 14445. It looks like a 1960s train locomotive. These machines were made in Japan for White. This is the only machine in our collection that has a left aligned needle. It will sew a full width zig-zag, progressing from the left instead of centered as most machines on the market. We have used this machine briefly and it does sew a nice seam. Jim discovered it was not a good machine for sewing quilt patches together. Since the needle is left aligned, only one of the feeddogs engages the fabric with a 1/4-inch seam allowance. 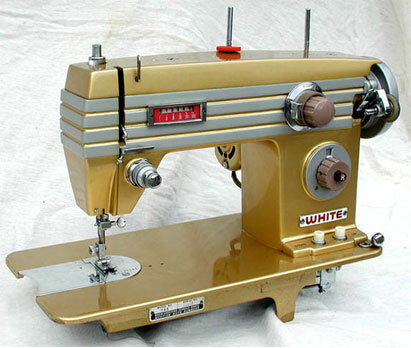 Other "normal to Jim" machines use a center-aligned needle and a half-inch wide pressure foot so a quarter-inch seam is just a matter of aligning fabric to the side of pressure foot. Jim often forgets that sewing machines are made for lots of things besides sewing quilt patches together! We do not have an owner's manual to verify our belief and would appreciate help in locating one. Threading the machine is very typical for the era. It uses a push button for reverse. The white buttons on the lower right raise and lower the feed dogs. 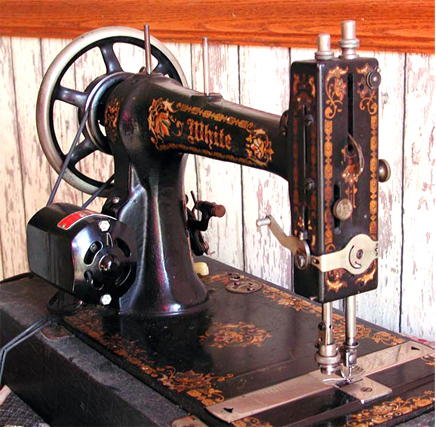 This White Vibrating Shuttle sewing machine pictured above is our oldest White. It is portable and electric. We have not tried to sew on it. It is a vibrating shuttle machine. The bobbin, which is nestled in a boat-shaped shuttle, is swung back and forth in an arc tossing the bobbin through a loop in the upper thread forming a locked stitch. Travel of the shuttle can be viewed under the two slide plates. It was originally a treadle. Most of these conversions of treadles happened during World War II when new machines were nonexistent and people wanted to "modernize." Kits were sold for converting treadles to electric and that made it a fairly simple task. Sort of a form of recycling. Also, the VS III was quite long running as a model -- 1893 through 1928. The changes were minimal, mainly an upgraded bobbin winder and a different shuttle just after the turn of the century. White did not name these models other than to designate those following their initial offering as an "Improved White." Thanks to Katie Farmer, a White researcher, for these words and who refers to this particular machine as a White VS III.